When it comes to CT scanner systems, no other manufacturer has enjoyed the same multi-generational success and popularity as GE. Their Lightspeed, Brightspeed, and Optima scanners have an exceptionally wide install base in hospitals and clinics all over the world. 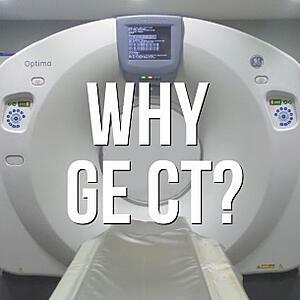 All this success begs the questions: Why do so many imaging facilities choose GE CT? In the video clip below, we'll share three big reasons why GE CT scanners are more common in hospitals and clinics than scanners from any other manufacturer. Paul Crawford is Vice President, CT at Block Imaging. In addition to his role here, he is also a husband and father of three. Paul believes the biggest value a business partner can provide is a partnership built on trust and strives to earn that trust with transparency in every conversation, project, and transaction he’s a part of.